Let’s face it, solar is becoming so prevalent, a new project announcement is kind of a yawn. But Maryland offered an exception this week when it unveiled a solar project that incorporates energy storage and creates one of the nation’s first commercial-scale solar microgrids. Developed by Standard Solar and Solar Grid Storage, the 402-kW plant serves the corporate headquarters of Konterra, a sustainable mixed-use community in Laurel, Md. With 1,368 panels, the solar canopy offers enough capacity to generate 20 percent of the building’s annual power. Governor Martin O’Malley dedicated the project in an official ceremony October 15, with speakers that included Jon Wellinghoff, chairman of the Federal Energy Regulatory Commission. What exactly makes this project interesting? First, Konterra offers a preview of what’s likely to be the growing coupling of photovolatics and energy storage. In this case, the storage takes the form of batteries. The system stores energy for use by the building and sells services into the wholesale power market. Second, the project arrives about one year after Superstorm Sandy, the storm that will likely go down in history as spurring microgrid in the US, or at least in the Northeast and Mid-Atlantic, where multiple-week outages taught the value of back-up power. The Konterra project functions as a microgrid in that it can island itself from the larger grid when a power outage appears imminent. So if the grid’s power lines begin to tumble – as they did during Sandy – the Konterra building remains isolated from the cascading failure and retains power for its critical needs: lights, computers, pumps, motors and the like. The project earns revenue by selling grid regulation services to the PJM Interconnection. This is in keeping with Solar Grid Storage’s business model, which is to find a combination of revenue streams that make projects attractive to investors. The financial proposition is likely to vary by location. For example, while PJM needs regulation services, California is likely to favor a project for its ability to reduce demand charges, which are high in the state, Leyden said. Konterra, PNC Bank and Solar Grid Storage financed the project with the help of the Maryland Energy Administration’s ‘Game Changer’ Grant. In addition to the solar panels and storage, the project includes two electric vehicle charging stations and expansion ability to add four more. For Solar Grid Storage, even bigger things are ahead. The company plans to launch a 2 MW project in North Carolina with Dominion Power in the first quarter of 2014. These projects are in keeping with what Navigant Research sees as growth ahead for energy storage and microgrid. Worldwide, microgrid revenue is now just under $10 billion and will reach $40 billion annually by 2020, according to Navigant, which pegs North America easily as today’s microgrid leader with 2,505 MW of capacity, followed by Europe with 508 MW and Asia Pacific, 387 MW. In the US, the strongest microgrid push comes from California and the Northeast, according to Peter Asmus, a principal research analyst at Navigant and author of Market Data: Microgrid. These states are boosting microgrid incentives and offering procurement models to encourage more energy storage. Looking forward, Asmus sees data centers as a strong, potential commercial market for microgrids, along with remote hotels and resorts. Microgrids can already be found on many college campuses, hospitals, military bases and similar self-contained facilities that often have multiple buildings. More microgrids are being planned. Keep an eye on these pages for future developments. 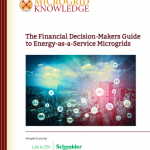 Do you want to keep on top of microgrid? Join our LinkedIn Group, Energy Efficiency Markets, where we regularly post news and updates. kind of feels that you are doing any distinctive trick. Also, The contents are masterpiece.